Here’s the November article from Bodhi Tree’s Breathing Room Newsletter. I also made this soup for a recent Monday Night Supper Club potluck. It worked very well as an amuse-bouche garnished with a little thyme and a baby parsnip. Delish! Yoga, in its purest form, is about being present and aware in every moment of your life. We are all built with five tools that act as a gateway to this present moment awareness: the senses. Some moments your senses may be engaged with perfect clarity; you are aware that you feel the body you’re in, see the colours around you, hear the sounds in your environment, taste each morsel you eat and smell every aroma that wafts your way. Other moments, due to stress, routine or the mind’s games, your senses may be clouded, or on auto-pilot. Along with the senses, asana, meditation and pranayama use drishti (focal point), intention (love!) and mantra (om) to help you focus, calm the mind and bring about present moment awareness, if only just for a second. What’s great about these techniques is that they can be applied outside of yoga as well, to work, relationships and even cooking. This month’s recipe stars parsnips, which are abundant at farmers’ markets as Autumn matures. Using a recipe that focuses on one ingredient will help you engage your five senses, becoming present and aware as you’re cooking. Pay particular attention to how the parsnip’s aroma changes from raw to cooked. It’s an experience you won’t want to miss! oil and toss with salt and pepper. Bake 40 minutes, until vegetables are soft and garlic is golden. In a large pot, squeeze garlic out of its peel, combine with roasted vegetables and stock. Bring to a boil then reduce heat and simmer for 15 minutes. Purée in a blender or food processor. Add ginger, thyme, nutmeg and season to taste. Garnish with fresh thyme and roasted baby parsnips. 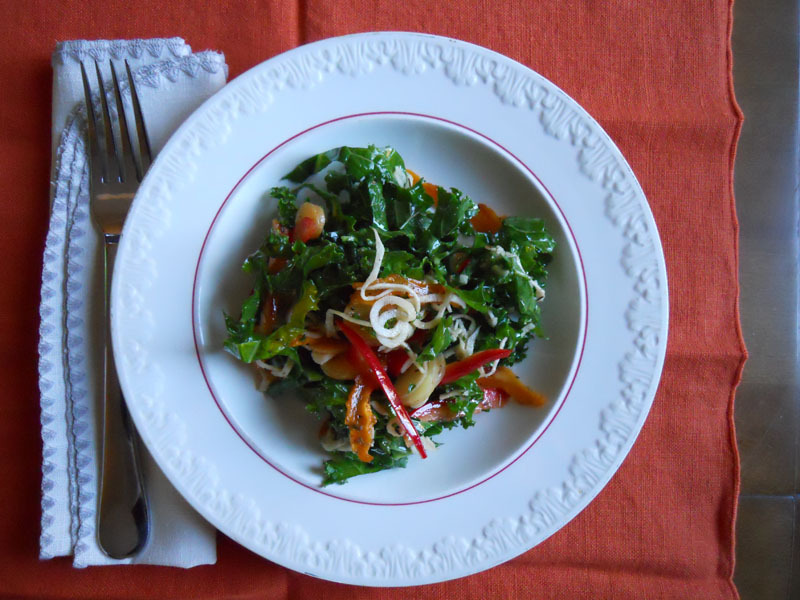 I’ve been making a version of this salad a lot over the past few weeks because of the abundance of kale at the farmers’ market and thus in my fridge. It’s super quick to make and because kale is so hearty, it lasts for up to 4 days. Experiment with different greens, dried fruits and ingredients in general! I like to make a large mason jar of vinaigrette and have it in the fridge to use at any time. Toss everything in a bowl with dressing and let sit for about 2 hours. Kale will start to soften. Portion out individually and store for up to 4 days. Here’s the original article from the Bodhi Tree’s March 2011 newsletter.